The metrology services in the ECOWAS region are developing in a coordinated, demand-oriented way, based on the division of tasks. The performance of the available regional metrology is improved. With its multi-level approach, the project is mainly focussing on the meso level, i. e. strengthening the institutional, professional and cooperation expertise of the national institutions for Quality Infrastructure (QI). 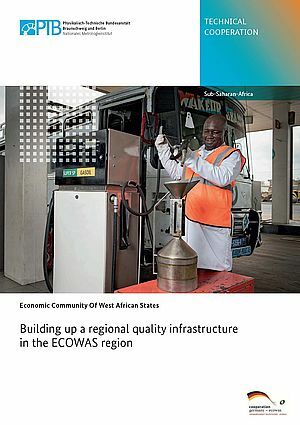 At the macro level, the regional representation body of the national institutions for Quality Infrastructure, the ECOWAS Commission, provides support to its member states as part of its central coordination role. The projects is characterised by three core intervention areas: 1) Improving the institutional performance of central partner institutions to sensitise customers and political decision-makers, 2) Strengthening the strategic expertise of the ECOWAS Commission and of individual national political players, and 3) Pro motingand building up techincal capacities in metrology at national level through technical training, consulting and partly procuring techncial equipment and promoting cooperation in metrology at subregional, regional and international level. The methodical approach concentrates on technical, organisational and management consulting. Whereever >possible, cross-border and cross-institutional capacity building is conducted and the setting up of information and dialogue platforms as well as technical networks is promoted. These measures are contributing to jointly conducted learning and qualification processes of the most important national and regional organisations. Since ECOWAS was founded in 1975 as an allicance for regional integration it is pushing the political and economic developement of the region. The objective is the establishment of a customs and monetary union amoung the 15 member states. Being a member of the WTO involving specific trade arrangements, ECOWAS gives important inputs to the social and economic development of the region.The member states will only benefit from the liberalisation of the markets if they are able to comply with the quality requirements of the international markets. Therefore, technical regulations and international standards (e.g. quality and safety standards, ecological and sanitary standards) have to be applied in order to remove technical barriers to trade. The currently existing QI has not yet met the needs of consumer protection or the quality requirements of the markets, neither quantitatively nor qualitatively. Due to the fact that the national economies of many ECOWAS countries are only weakly developed the demand for an enhancement of the national QI systems is limited. Regional cooperation and the division of tasks in the field of QI services (measurements, standardisation, testing, quality assurance) is therefore essential. The project addresses specifically the field of measurements, which is a precondition for the development of other QI services. The project is part of the GIZ-coordinated program “Supporting the ECOWAS commission through managerial and technical advice”, aiming at strengthening the institutional capabilities and the technical competence of the ECOWAS Commission. ECOWAS and PTB are cooperating closely with UNIDO, an important partner in developing QI in the region.